Adam Idah celebrates with his Ireland team-mates at Tallaght Stadium. 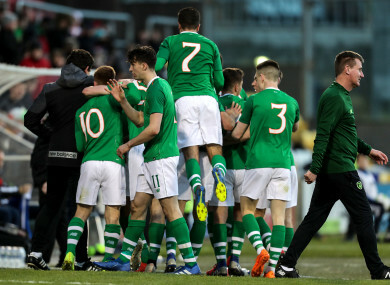 IRELAND U21S GOT their Euro 2021 campaign off to a positive start with a comfortable 3-0 win over a lucklustre Luxembourg in Stephen Kenny’s first competitive match in charge today. In from 4,472 spectators in Tallaght, goals from Adam Idah (2) and Neil Farrugia earned the Boys in Green a convincing win against a side that offered little going forward and looked a beaten team as soon as the first goal broke their spirit. With Mick McCarthy and his coaching staff watching on in the crowd after their return from Gibraltar, it was one-way traffic from the outset as Ireland went close early on. Connor Ronan’s cross found Jayson Molumby, whose header back across goal caused panic in their opponents’ ranks, with Farrugia narrowly failing to get to the ball ahead of the defender. Three minutes later, Zachary Elbouzedi, one of three League of Ireland players to feature in the starting XI, found Idah with a lofted through ball. The lively Norwich youngster took one touch before blasting the ball into the side netting from a tight angle. Luxembourg managed to stem the early pressure on their goal, however, with Ireland’s only other effort of note a Connor Ronan shot from distance that went well off target. After half an hour, the hosts had plenty of possession but were short of inspiration, with a lack of intensity in their attack play. Out of nothing, however, Stephen Kenny’s side took the lead. Neil Farrugia’s corner found Adam Idah at the near post and the Norwich youngster expertly directed a header home. Four minutes later, Ireland doubled their advantage. After the visitors lost possession, Ronan received the ball in midfield before slipping through Farrugia and the UCD youngster clipped home a lovely finish. Luxembourg were losing their discipline at this stage. Ronan took advantage of a poor pass to start a counter-attack, before clever link-up play involving Idah and Elbouzedi resulted in the latter firing the ball a few inches over. Jayson Molumby threatened to get in on the act just after the break, with the Brighton youngster firing a shot just wide from distance. Shortly thereafter, Ronan curled in an inswinging free kick from the left that somehow evaded everyone and went just wide. Just before the hour mark, Molumby almost added a spectacular third. After a poor clearance from goalkeeper Tom Ottele, the youngster’s audacious lob from 35 yards out came back off the crossbar. Ireland continued to dominate in the second half, and they got a third to effectively seal the victory on 68 minutes. Ronan was key again, playing through Idah, whose powerful finish could only be helped on its way into the net by Ottele. The one worry for Kenny came towards the end, when team captain Molumby appeared to pick up a knock and was replaced by St Pat’s youngster Jamie Lennon. The result means Ireland go top of a group that also includes Italy, Sweden, Iceland and Armenia, with no other games having been played yet. The Boys in Green next play a double header in September, hosting Armenia on the 6th, before travelling to play the Swedes four days later. For now, Kenny can reflect on a satisfactory first competitive game, with Idah, Farrugia and man-of-the-match Ronan among the standouts. Subs: 23. Gavin Bazunu 4. Corrie Ndaba 12. Barry Cotter 14. Jamie Lennon 16. Daniel Mandroiu 18. Michael O’Connor 19. Aaron Drinan 21. Liam Scales 22. Brandon Kavanagh. Subs: 12 Joao Machado 13. Lucas Coopmans 14 Loris Tinelli 15. Dylan Kuete 16. Yannick Schaus 17. Fabian Heinz 18. Tiago Semedo Monteiro. Email “Norwich teenager grabs brace as Ireland get Stephen Kenny's reign off to a winning start”. Feedback on “Norwich teenager grabs brace as Ireland get Stephen Kenny's reign off to a winning start”.